I was born in 1966 in Paris, France, where I lived until 1994. When I was ten years old I visited the Rijksmuseum in Amsterdam and was fascinated by the miniatures. Home again I made my cupboard into a huge dollhouse that still exists, with various floors and incredible details. Every shoebox could become a miniature fabric shop. That is how my love for art began. At age 15 I went to school in England and it was then that I discovered that the joy of my life was drawing. Since then I would spend hours and hours of my free time sketching, creating lines for the basic patterns and adding colours. I obtained my diploma at Penninghen, L'ESAG, after having studied from 1985 to 1990 in Paris. Then I worked at Jean Paul Gaultier's and at Doré Doré. In 1994 I got married to Edgardo Koestinger, Mexican, and went to live in Mexico. For ten years we lived in Oaxaca where our four children were born. In 2005 the whole familly moved to Seville in Spain, then to Madrid and in 2010 to the Loire Valley in France. I have painted for 20 years. I have regularly had exhibitions, solo and in groups. 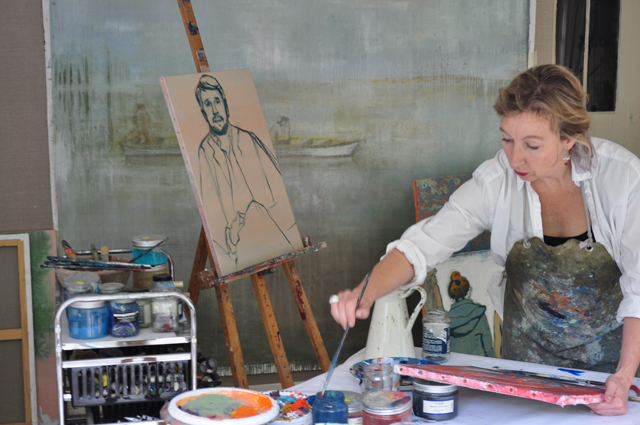 I have exhibited my works in France, Mexico, Spain, Switzerland and Belgium and have painted around 150 commissioned portraits. Creating and painting is a necessity to me. My inspiration is rooted in the context of my daily life, my family, my children and circumstances that cross my life. I am influenced by many painters, e.g. Van Gogh and the Nabis painters for their colours, Toulouse Lautrec for his silhouettes, Basquiat for his strong lines, Helene Schjerfbeck for the way she wipes the paints with a cloth. When I paint, I look for beauty. I would like my work to transmit peace, serenity and hope, which are also the things I aim for in my own life. There is a certain solitude in some of my paintings; a positive and necessary solitude for which one needs to hear what is in the depths of one’s heart. 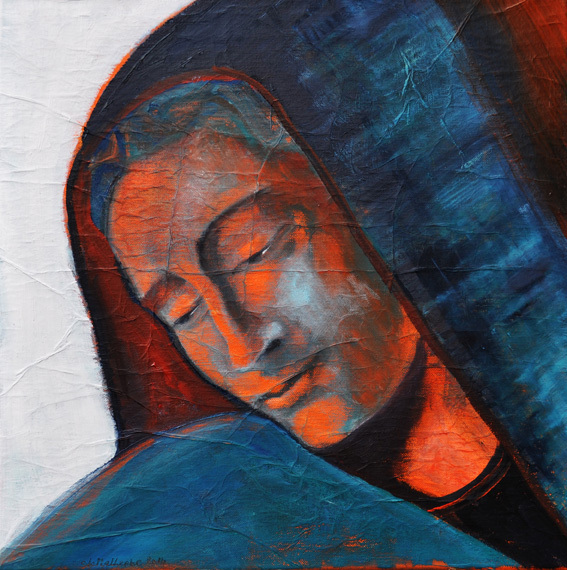 The link which exists between my painting and my faith is always there, more or less consciously, more or less visible, because my faith is part of my life and for me God is in all aspects of my life, including my work. I think the beauty I look for is in a certain way a search for God, who is the source of beauty. My life and therefore my work is a series of questions about destiny – the destiny of my children, my husband, of people I love and people I meet in the street. 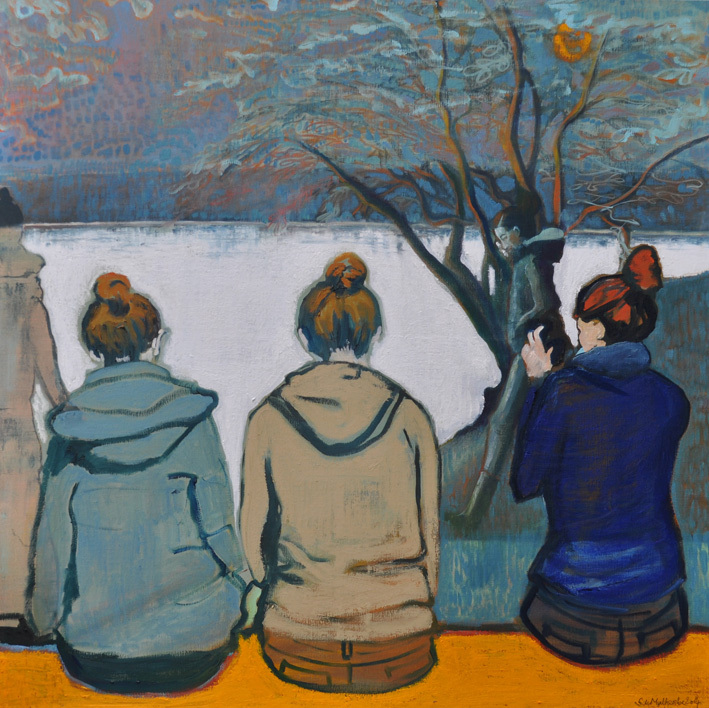 This is what I have expressed in my series of paintings called The space of time (shown here on the website), in which the subjects of the painting are always facing away. The coloured dot, often in the top right corner of my paintings, is a symbol for the destiny of human beings, encapsulating my belief that we are each on a lifelong pilgrimage towards God. The two little paintings with the title What is man that you are mindful of him? form the beginning of a new series of small paintings mainly of faces inspired by sculptures, by Camille Claudel, the Christ of the Pieta etc. 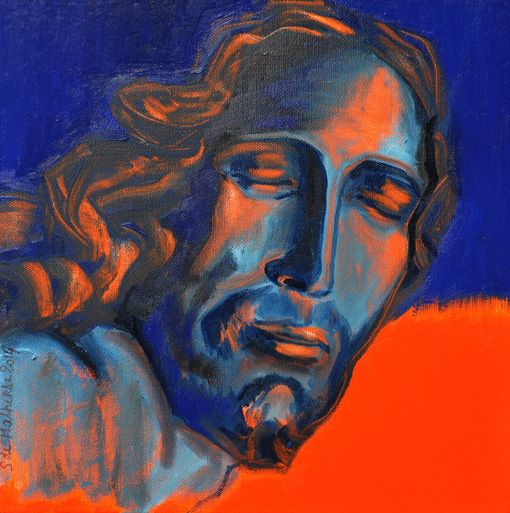 In this way I contemplate the works of these wonderful artists through their eyes, focusing on the faces – faces that reflect the unique nature of human beings for whom Christ has given his life. Deep within us we have a capacity to be moved by beauty, a beauty which inspires us to look up and believe there is a positive meaning to life which is real but invisible at first sight. Art is a gift, which is called to strive towards this beauty. This is what I try to achieve in my work. I have three different ways of approaching a painting. The most common is a free transformation and interpretation of something that strikes me, moves me, either from life or from a picture. When working on a commissioned portrait I focus all of my attention on the eyes, which are the reflexion of the soul, in order to catch something authentic of my model. In the rest of the canvas I interpret their character through the use of colour, the depiction of the clothing and the background. The third way in which I approach a work is more recent and comes from a deep necessity to express a feeling or idea. The idea comes first, while I draw or paint from pure imagination. Within these three approaches I find the freedom to create something new every time I paint. They all have in common that I start with covering the canvas with a colour chosen by intuition. It is usually a bright warm colour applied in acrylics and oil. Then I continue by painting with oil in a complimentary tone, while lines start to appear. The colours are of extreme importance to me and I like to have a contrast between cold and warm tones. I like the colour black in drawings and ink sketches, although I have not used black in recent years but a very dark blue. Every time I start a new painting, it is an immense joy and sensation of freedom. 1. THE SPACE OF TIME VIII, 100x100 cm, oil on canvas. 2. THE SPACE OF TIME IX, 40x80 cm, oil on canvas. 3. INTENSITY, 30x30 cm, oil on canvas. 4. WHAT IS MAN THAT YOU ARE MINDFUL OF HIM?, 30x30 cm, oil on canvas. 5. WHAT IS MAN THAT YOU ARE MINDFUL OF HIM? 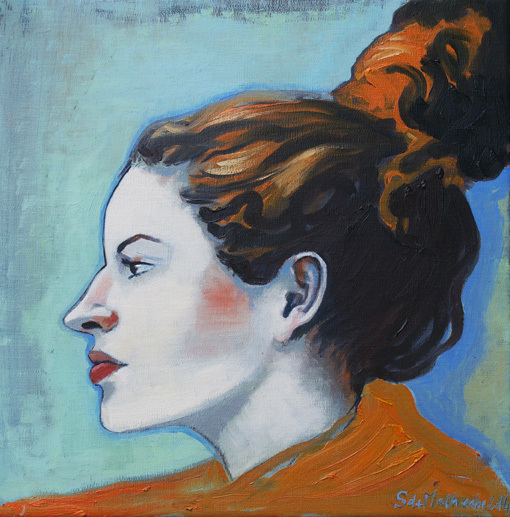 II, 40x40 cm, oil on canvas. Galerie Béranger, 30 Boulevard Béranger, TOURS.